"In 1939, Rikard Lindström wanted his family to be able to swim in the bay by the house without having to worry about the sewage polluting the water." Rikard constructed the first Clivus Multrum on his property when he found the existing toilet system was not reliable. Sweden had a new invention entirely in harmony with nature. Interested neighbours began to take part in Rikard Lindström’s ideas and a small production started. 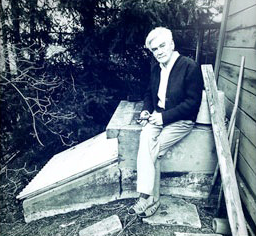 Kurt Atterberg, a patent engineer and one of Sweden’s most famous composers, persuaded Rikard Lindström to apply for a patent and one was filed in the 1960s under the name of Clivus, the Latin word for inclination. Rikard Lindström died in 1993 but his name lives on. His closed system preserves water and prevents toilet waste from polluting water sources.